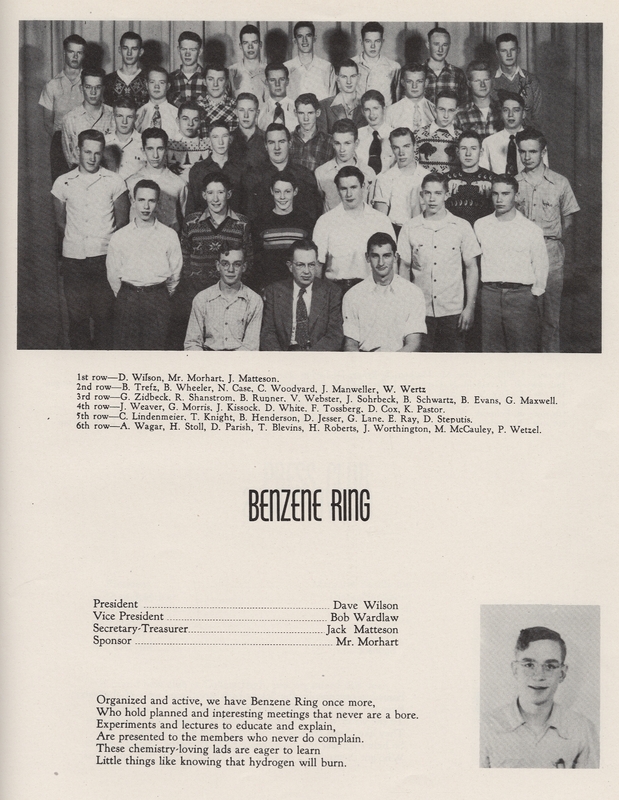 Back in December, we wrote about yearbooks and featured the 1948 Fort Collins High Lambkin (see the Ski Club here). This time, we’d like to look at a few other clubs from the same year of the Lambkin: the Chemistry Clubs. 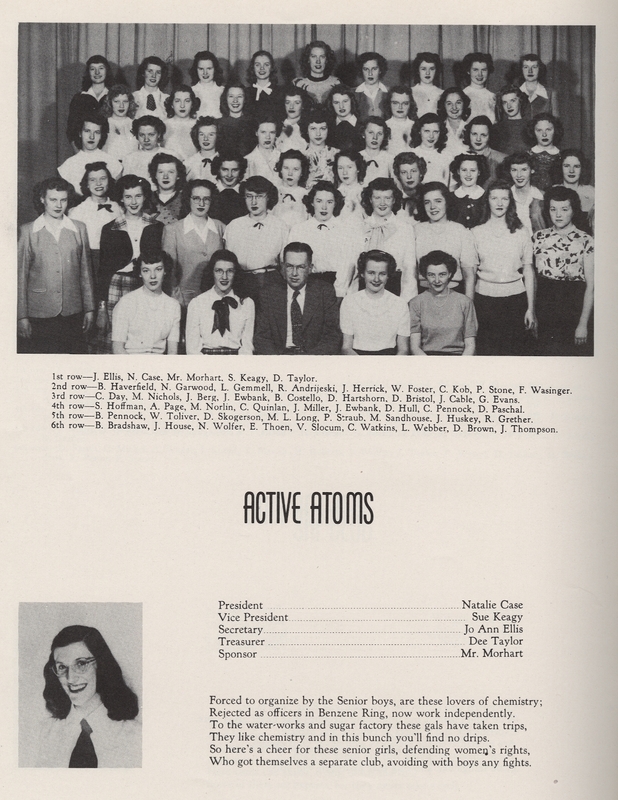 Both clubs, Benzene Ring and Active Atoms, drew in quite a few members (including some who also participated in the ski club and still had their sweaters for club picture day). You’ll notice from the poems included on each club’s page; the girls were excited to get their own club after being “rejected” by the boys’ club. Who hold planned and interesting meetings that never are a bore. Are presented to the members who never do complain. Little things like knowing that hydrogen will burn. Rejected as officers in Benzene Rig, now work independently. They like chemistry and in this bunch you’ll find no drips. Who got themselves a separate club, avoiding with boys any fights. Back in November, we blogged about astronaut Dorothy Metcalf-Lindenburger, set to become the first Fort Collins High School graduate in space. Well, early this morning, Space Shuttle Discovery lifted off and carried the first Lambkin into orbit (two Lambkins, actually: Metcalf-Lindenburger, and a stuffed FCHS Lambkin mascot named Clyde!). 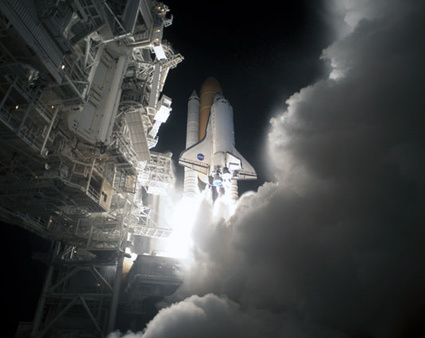 The mission, Discovery’s 38th flight, is carrying a crew of seven, including two other rookie astronauts besides Metcalf-Lindenburger (the last rookies who will fly on the Shuttle). The flight is scheduled to last 13 days and will deliver a multi-purpose logistics module called Leonardo, that will be attached to the International Space Station temporarily and then returned to the shuttle’s cargo bay. Leonardo is packed full of supplies, new crew sleeping quarters, and science racks that will be moved into the station’s laboratories. Yes, I know that it’s really football season right now, but this archivist is a tried-and-true baseball fan who is counting down the days to Spring Training (mandatory reporting begins on March 2, by the way). Not that there’s anything wrong with football, but baseball season means warmer weather, green lawns, sunshine, and that chance to catch that home run ball at the big game. I can’t wait! To warm up for the season, here’s a fun picture from the 1920 Lambkin, the Fort Collins High School yearbook, that shows off the super skills of the Girl’s baseball team. 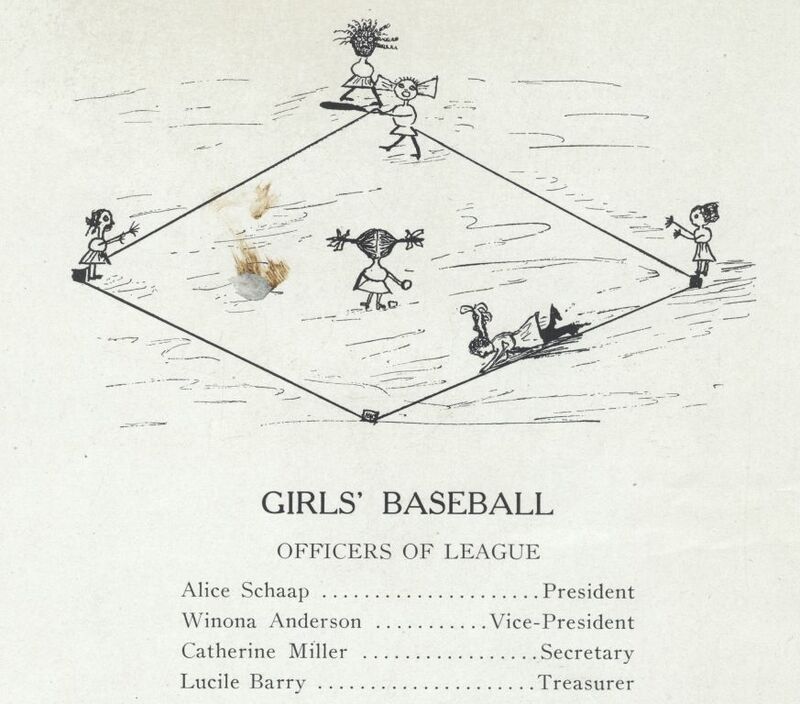 The text beneath the sketch reads “Girl’s Baseball League has been organized under the auspices of the Round Table Girls. This furnishes a much needed form of athletics for the girls…The girls who are working for this sport confidently expect to put on some fine games before the public in the coming year.” Play ball! Now, this is a Fort Collins-related flight story worthy media coverage. I’ve heard several times about the Fort Collins High School (FCHS) graduate who is an astronaut. On Monday, November 9, an article appeared in both the Coloradoan and the Denver Post announcing that when Astronaut Dorothy Metcalf-Lindenburger (FCHS, Class of 1993) flies on the shuttle in March of 2010, she will carry with her a stuffed lamb, the mascot of FCHS, named Clyde who will be dressed in a homemade, gold-lamé flight suit. Metcalf-Lindenburger represents what can happen when you follow dreams: she was a science teacher who told her students that she wanted to be an astronaut. As only kids can, they replied to her, “Why don’t you become an astronaut?” Instead of making excuses and listing reasons she couldn’t, Metcalf-Lindenburger applied and was accepted into NASA’s Astronaut Training Program. In just a few short months, she’ll become the first Lambkin in space. I find this significant because Metcalf-Lindenburger succeeded at STEM-based education (science, technology, engineering and mathematics) in our local school district, which provided her the foundation for her college studies as well as her time in NASA’s Astronaut Training Program. Studies have shown that U.S. students in fourth grade rank high in academic performance in math and science when compared with other industrialized nations. That ranking consistently drops as students progress through the grades. By twelfth grade, U.S. students’ academic performance in math and science is poor when compared with other industrialized nations; our ranking is near the bottom of the lists, some of which number over 40 countries. Other statistics address the change in STEM education performance by U.S. girls as they progress in school. Studies have shown that girls perform as well as, if not better, than boys in STEM-based education in elementary school. This begins to change in sixth grade and by the time girls graduate from high school, they are significantly underperforming in math and science when compare to boys. It is important to note that underperformance, by both U.S. students generally as well as girls specifically, is not a result of lack of aptitude. Metcalf-Lindenburger clearly had aptitude, a desire to learn, and a community of teachers (not to mention family) that helped her to not just perform well in STEM education, but to excel and apply those skills to a profession that requires exceptional STEM abilities. Congratulations on your pending space flight, Ms. Metcalf-Lindenburger! You can be sure that we here at the Fort Collins Museum & Discovery Science Center will be using your story to encourage youth to follow their dreams and work hard at their math and science classes in school. By the way, would you consider bringing Clyde to the Museum for a visit after your mission? I think I can get you in for free.